With grilling season in full-swing, we recently chatted with outdoor cooking enthusiast Brian Greving of Clarion. Brian, his wife Katie and children Alex and Natalie love living in a vibrant rural community, cooking and spending meal time together. Brian has worked in the banking/financial services industry for more than 20 years, enjoys watching the St. Louis Cardinals and following the Iowa State Cyclones. The family also enjoys traveling and spending time at the pool. Are you a grillmaster? If so, what is it and how did you get those credentials? Grilling with Brian Greving of Clarion. You could call me a self-proclaimed “grillmaster” as I use my grill all 12 months of the year. My true credential is that I am a Certified Barbeque Judge. I obtained this in 2003 by taking an all-day course through the Kansas City Barbeque Society and judging numerous barbeque cooking contests. I’ve also attended numerous barbeque day “camps” – some sponsored by the Iowa Barbeque Society and some by the Iowa State Meat Laboratory. All of these things have taught me the art of smoking meat low and slow and using different woods. I have also entered quite a few many grilling/cooking contests. My favorite was a hamburger grilling contest that I entered with my kids. What got you interested in grilling? I am the oldest of four children. Growing up, my dad spent more time talking to the neighbors than he did watching our dinner cook on the backyard grill. Needless to say, we had a lot of overcooked meat! I think I was in high school when I took over the family’s grilling duties full time. It was fun and it allowed me to experiment with different types and cuts of meats and marinades. Since that time, you can usually find me by the grill at all social gatherings. I have to give credit to my wife Katie for getting me interested in the art of smoking meat. We were talking about what we wanted to do in the future, and I said I would like to travel the state/country judging barbeque contests. The next week she signed me up to take barbeque judging classes, which lead to my involvement with the Iowa Barbeque Society. Now, multiple smokers later, my training has taught me to prepare some outstanding meals. This time of the year, I really love my thick cut bone-in Iowa Pork Chop from my local meat locker. A lightly seasoned, juicy pork chop on the grill is one of my favorites. Usually this is accompanied by some fresh melon and, if we are lucky, fresh Iowa sweet corn, too! I actually have and use both… but honestly, I use my gas grill over 80 percent of the time. Gas grills are clean and easy to use, and once lit, they heat up quickly and consistently. Most gas grills have multiple burners so you can cook different foods simultaneously. I like to use my charcoal grill if I want to add some wood smoke to my meat. For the person who’s never grilled, words of advice for getting started? Have fun… grill something you want to eat, and don’t be afraid to experiment on the grill. You also don’t have to only cook meat on the grill. Don’t be afraid to cook fruits and veggies. I suggest that new grillers get some long-handled grilling tongs to turn the meat on the grill and an instant-read meat thermometer. The instant-read thermometers will allow you to check the internal temperature of the food when you think you are at the end of your desired cooking. If your meat has not reached the desired temperature, leave it on the grill. 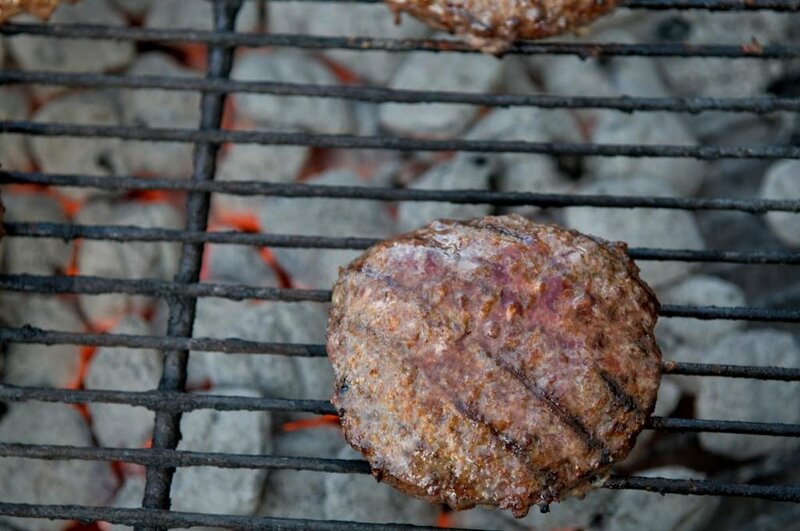 What are the most common mistakes when grilling? The first is using a grilling spatula and pressing down on burger patties. Don’t do this – it releases all the tasty burger juices. And second, not cooking meat to the proper temperature. Undercooked meat presents a health risk. But you don’t want to overcook it either because then it gets very dry. I prefer most of my meats cooked either medium rare or medium. I also take my meat off the grill when the internal temp is 5-7 degrees below the recommended degree of doneness. I then cover it with foil and then let it rest for at least 5 – 10 minutes. The meat will continue to cook during this resting time, and resting also ensures that the internal juices of the meat are properly distributed. Are there some helpful online resources to learn more about firing up the grill? I would recommend checking out www.weber.com and www.seriouseats.com/grilling. For some fantastic recipes I have always found www.allrecipes.com very helpful. Can you share a favorite grill-time recipe? My all-time favorite versatile marinade is my mom’s teriyaki for either chicken, pork or even seafood (I have used this on shrimp & salmon). Combine all ingredients in a pint-sized jar, cover tightly and shake to mix. You can keep this marinade in the refrigerator until ready to use. Put your desired meat in a Ziploc bag and add the marinade, allowing to marinate for at least 2 hours. I also really enjoy cooking seafood on the grill. One of my favorites is a seared Asian Ahi Tuna steak. To make marinade, whisk together soy sauce, honey, garlic, and ground ginger in a small bowl. Place tuna in a reseal able plastic bag with marinade. Refrigerate for 30 minutes. Heat grill to high heat (direct heat). You should start with clean grill grates, and always brush the grill grates with either olive or vegetable oil to ensure the meat will not stick. Cook tuna on each side for 3 minutes or until your desired doneness is reached. I recommend serving this tuna steak on a bed of mixed greens. If desired, drizzle the tuna steak with additional soy sauce and honey.